Designed as a supplement for either Algebra or Calculus-Based Introductory Physics, Tuszinski offers a wide breadth of biomedical applications plus an emphasis upon quantitative problem-solving. The hundreds of applications in the book are organized according to the standard introductory course syllabus; their variety is intended to show life science and allied health students the relevance of Physics to their future academic and professional careers. J. 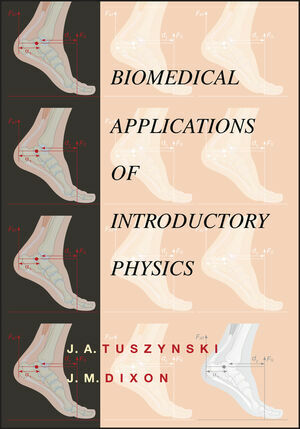 A. Tuszynski and J. M. Dixon are the authors of Biomedical Applications for Introductory Physics, published by Wiley. Can be utilized in either Algebra or Calculus-based courses and is available either as a standalone text or as a supplement for books like Cutnell & Johnson PHYSICS, or Halliday, Resnick, & Walker FUNDAMENTALS OF PHYSICS. Math level is Algebra & Trigonometry; however, a few examples require the use of integration and differentiation. Unlike competing titles, Tuszynski offers both a wealth of engaging biomedical applications as well as quantitative problem-solving. The quantitative problem-solving is presented in the form of worked examples and homework problems. The standard organization facilitates the integration of the material into most introductory courses.